It is dark and dreary and looks like fall instead of spring. There is a wind starting and a little lightening. They say we are in for a high wind warning, which always worries me because of the trees that are so close to the front of my house! On one of the last visits I had with my mother before she died, she told the nurse that I was a "wonderful" flutist and that she was very proud of that. Every time I play now I think of Mom and that particular incident. Sometimes if I really think a lot about it, I remember all the flute lessons she took me too and all of the performances and activities she drove me too. She really did nurture that part of my development. This month, for the first time ever, my flute is featured on the new CD by the Peace Together Choir called Be Still My Soul. I wish Mom was alive to hear it - she certainly did have a part in it for me. That Sam has his pizza delivery job. I really see some new responsibility in him since he is now making his own money. I am also thankful that although Sam and I fight from time to time, (usually about how much time he is or is not spending on his studies) we always make up quickly. I always vowed that I would never have long fights with my children and so far I haven't. And I am thankful for that. My latest free online site for helping Sam prepare for the Natural Science CLEP exam. Hippo Campus. My clothes from today's, very well-attended, concert - black pants, white shirt and black vest. to start the FIRM Fitness Challenge rotation tomorrow - not looking forward to it! We are half way through lent. My Lenten plans are not going as well as I had hoped. Extra spiritual reading. (Started The Autobiography of Saint Therese of Lisieux: The Story of a Soul, but haven't delved completely into it yet. Stricter adherence to the Divine office. This one I'm doing pretty good on. Rosary as a family. Having trouble getting the family all together -particularly the older kids! Stations of the cross on Friday at Church. Been doing great at this - haven't missed a Friday yet! the buzz in my ears and the humm of my computer, and some kind of program with a lot of beeping and the roar of engines coming from the t.v. room? Spring cleaning continues with the classroom and hopefully pantry this week. When Rosie was a baby, I got her a little plush nativity set a little like this one. It had a stable and a baby Jesus connected to the manger, Mary, Joseph and I think some animals. Over time we lost or misplaced almost all of it except this one figure. It's really Joseph, but Rosie insists that it is baby Jesus and won't tolerate anyone saying it's not. More than that she sleeps with this little figure every night. A few months ago the dog got a hold of it and pulled off his hair! Rosie was devastated. I heard her literally wailing, "Who would do something like this to ME!!" Drama queen - I know. I had to go to the hobby store to get some yarn to replace his hair and then spend some time on Youtube learning how to do doll hair! Rosie wasn't happy with my results at first, but now she has forgotten that and she is content to sleep with her little "Baby Jesus" once more. 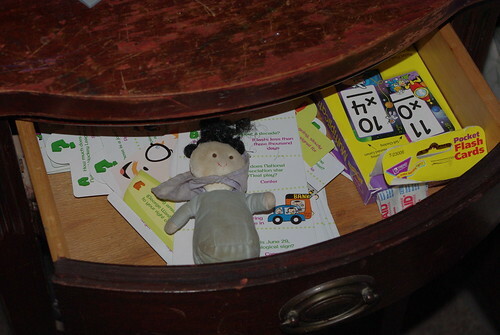 And when she wakes up, she simply puts him in the night table drawer! One of the more redeeming parts of The Tudors. Thank you for posting today. I love the Simple Woman. I really loved yours today. It did make my want to cry because do we ever forget our mothers and the influence on our lives? I will check out the CD I love flutes. I am so happy God gave me the gift of six children. I love that you have six and that you home school too. Thank you for becoming a follower, I am so blessed. One can read and re-read the Story of a Soul and never be at a loss of new inspiration and wisdom. What a great choice for your Lenten journey! God bless you as you enter this Holy Week and await the Triduum!